I found this four sided lamp shade at my favorite thrift shop last year and knew immediately what to do with it. This is really too simple for a tutorial, so I'll just post up a few pics. 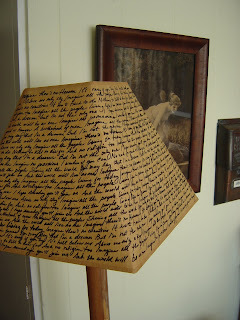 To complete this project I needed the lamp shade, a black permanent marker, craft paint brush, black acrylic craft paint and lyrics from a favorite song. On two sides of the plain lamp shade, outline the stylized leopard spots freehand with the permanent marker. Fill in with the black paint. 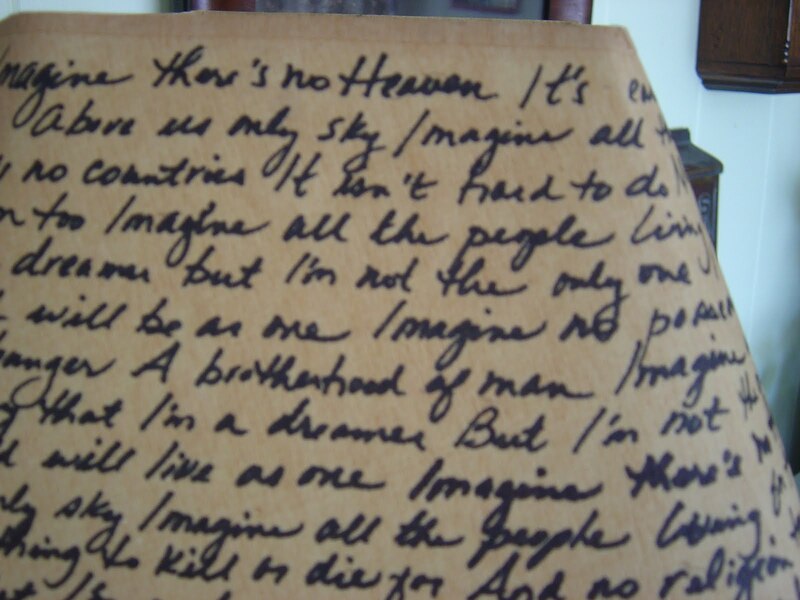 Using your best freestyle script and the marker, write the song lyrics on the remaining two sides. In this case I chose the song, "Imagine", by John Lennon. This post is linked to: Strut Your Stuff Thursday at Somewhat Simple and 100 Ideas Under $100 at Beyond the Picket Fence; join the party! Update: 5/28/10...... this humble lamp shade redo was featured by Becky at Beyond the Picket Fence! Thank you Becky! I love the lyrics idea...spots aren't my thing but I never would have thought of making a bipolar lamp. Brilliant. Wanted to say thanks for your visit to my blog today... I'm following you also... then i saw your "lamp shade".... love the "lyrics".. wonder if I can do the lettering as neat as you? What a clever idea, 2 shades in one. Love it!! Thank you for leaving your comment at junkblossoms so that I could find your blog. It is a wonderful blog. Pat. I like this idea! Decor that can change with your mood! I can see that coming in handy. PS Yes, crips are potato chips, same thing different name! Wow! So cute and creative. You have nice script handwriting too! I love this idea! Especially the song lyrics, awesome. What a great idea! I love the song lyric, it's my favorite too. I am presently eyeballing a lamp shade that is sitting so planly on the otherside of the room. 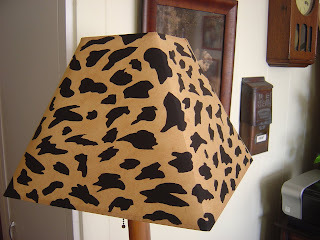 I featured this great lampshade this week! I'm inspired! 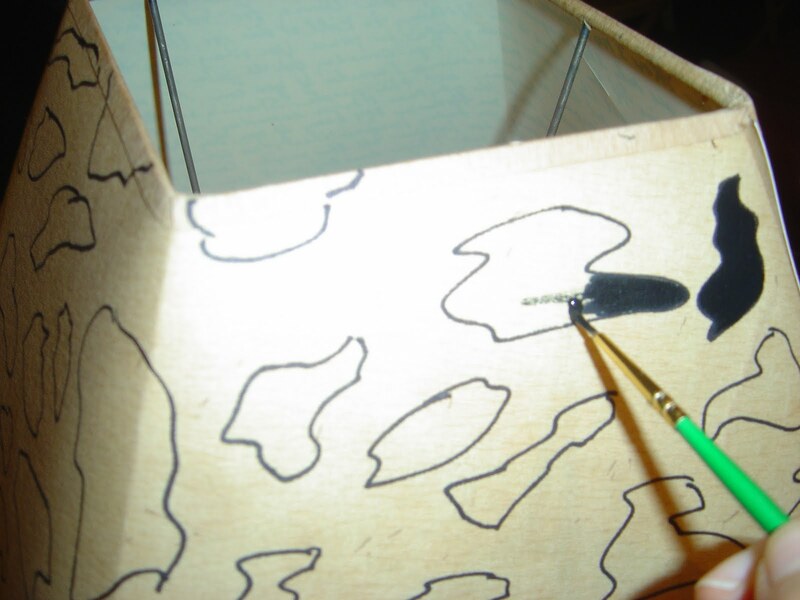 Thanks for documenting your project & sharing it w/us. It is right up my creative ally!